Inventory your hosts in ALL your data centers in seconds. See the make, model, and configuration of every host across all your monitored data centers from a single dashboard. 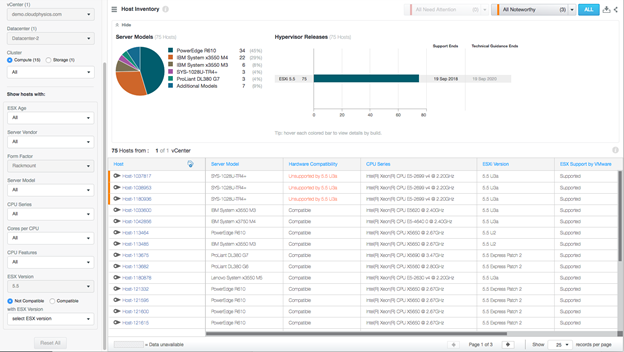 Take full advantage of your host inventory to create reports on which hardware vendors are currently deployed—plus hardware models, BIOS, and configurations for the systems in the data center. This enriched, up-to-the-minute information lets you confidently make decisions on capacity and resources available, and discover which resources should be upgraded or replaced.